There are a lot of diets out there – vegan, low fat, paleo, organic... but few of them are truly designed to bring the body back to a world of balance. The body is constantly walking a tightrope, and the lifestyle you have and the food you eat can pull you right off the wire. But what if you were eating all the “good” stuff – 2-3 glasses of milk a day, a whole wheat pita with hummus for lunch, sweet-potato oven fries with a dollop of lycopene-rich ketchup – but not absorbing it? Worse, what if those same foods were actually hurting you further? That is often the case with Crohn’s Disease – a devastating condition in which the body tears itself apart on the inside. An often overlooked treatment (there is, sadly, no cure) is a proper diet... and it may not be the Food Pyramid-style one you think. Elaine Gottschall became a revolutionary leader in digestive health when she developed the Specific Carbohydrate Diet, a program that has since led to thousands of would-be invalids with any number of GI conditions (namely Inflammatory Bowel Disease, celiac, colitis, food intolerances and even cystic fibrosis) experiencing full, enjoyable lives. A simple list of “dos” and “don’ts”, however, can be challenging for the lay person to translate into realistic meals and snacks, especially since the foods on the SCD can be unusual for some. Erica Keriwen lives the SCD life for the benefit of her son, who was diagnosed with Crohn’s Disease in 2005. She turned her life experiences and kitchen experiments into a comprehensive website and blog (http://comfybelly.com/) and compiled the best of her recipes into Cooking for the Specific Carbohydrate Diet: Over 100 Easy, Healthy, and Delicious Recipes that are Sugar-Free, Gluten-Free, and Grain-Free. Specific Carbohydrate Diet (SCD) is filled with a host of meals and snacks designed to be not just safe for the patient to eat, but tasty enough for the whole family (and any guests) to enjoy. The book starts off with 12 pages of in-depth SCD information – history, science and a little hand-holding in terms of “allowable” and “banned” foods all feature in the introduction. Be forewarned, though, that some of the “science” written in this book’s pages are a little biased, and that this dies has not been tested and approved as “official” treatment for any GI condition by the regulating bodies, nor does it work for every patient or situation. As with anything health-related, it is worth checking with your doctor before embarking on any diet program, whether it’s for weight loss or (like the SCD) to treat an underlying condition. Keriwen is, however, good at downplaying some of the more radical appeals of diet supporters, focusing on the basics without becoming too technical. While the book has a well-laid out table of contents, I wish the book also included an alphabetical index at the back as it would greatly facilitate using this book. The photos, taken by Keriwen, are stunning and their captions do contain page numbers for reference. This is something readers will be thankful for, since not being able to try the Stuffed Bell Pepper (p. 125) recipe after it is presented so beautifully would be a form of culinary torture. The recipes in SCD are varied, but not all of them are what I call “easy” – nor are they necessarily inexpensive to make. Many of the recipes in the later portions of the book require you to have one of the “basic” recipes from the second chapter already on hand. A tasty-looking Ranch Dressing (p. 73) needs both Mayonnaise (p. 68) and SCD Yogurt (p. 24), a process that is at least a 24-hour venture. Almost anything requiring cooking in fat uses Ghee (p. 28), which while not entirely foreign to Western palates is not something I can foresee myself just whipping up to make dinner. Still other recipes utilize Almond Milk (p. 16) and Coconut Milk (p. 19), which can be readily purchased provided you pay attention to the “dos and don’ts” on the list (p. 4-5). As most of the recipes also require the use of almond or coconut flours, nut butters and whole nuts, they can carry a hefty price-tag , and with honey as the sole form of sugar in the entire book those with sweet teeth will soon find themselves crying over their latest grocery bill. Given that this book is in no way vegan (fresh meat and fish, eggs and aged cheeses are allowed and encouraged), testing out this “unproven” lifestyle to cure any digestive woes requires a significant re-prioritizing of food spending. That said, for people at their wit’s end, the chance to achieve health is worth any price. While I have yet to figure out how any vegan could subsist on this diet (fruit and nuts? ), with time and planning adhering to the SCD can be made slightly more cost effective through creative use of allowable legumes, eggs, fruit and vegetables, using canned fish and only eating meat on occasion. Cost and convenience aside, what do the recipes in SCD taste like? I tried a few of the book’s offerings and I have to say I am impressed by Keriwen’s culinary talent. It was actually a struggle for me to find recipes in this book that I could safely eat, given that the SCD’s mainstays of nuts, coconut, meat, eggs and oil are my IBD triggers and allergies. However, with a few modifications I really enjoyed the Beet Chips (p. 50) sprinkled with a sprinkle of coarse sea salt. The Roasted Cauliflower Rice (p. 115) was also fabulous and surprisingly filling paired with some basic, spicy black beans (one of the few allowed beans). 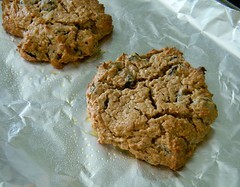 On the sweet side of things, my non-GI-affected mom and grandma fawned over the “Oatmeal” Raisin Cookies (p. 146), and remarked at how closely the shredded coconut emulated the forbidden grains. I had my doubts when I was mixing the batter (I used cashew butter as I’ve heard it better emulates the “cookie dough” taste), as it seemed too wet and I couldn’t imagine the coconut concoction holding together – but lo and behold the recipe not only baked up perfectly, but it smelled identical to my mom’s standard cookie recipe in the oven! For a few of my gluten- and dairy-free friends, I had to whip up a batch of Keriwen’s famous coconut flour-based Cinnamon Bun Muffins (p. 96). It’s a good thing the recipe only makes 8 at a time, because they made my house smell maddeningly like the famous mall franchise. 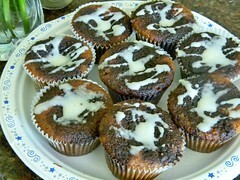 Apparently, they tasted just as good – if a bit on the eggy “French toast” side (the recipe uses 4 eggs per 8 muffins). The muffins did take longer than stated to bake through, however, and sunk a bit in the centre, but with such a wet, starch free batter that’s to be expected. Even sunken, the texture was akin to a lighter-style pound cake or a sour cream coffee cake with a baked-in topping. I can’t wait to try the same topping on a “normal” pound cake to see the result! 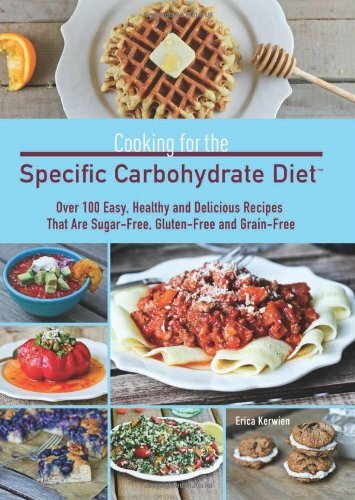 If a life with debilitating gut issues has turned you off the thought of ever cooking again, or if you are simply looking to eat fewer grain products, you can certainly do worse than a recipe in Erica Keriwen’s Cooking for the Specific Carbohydrate Diet: Over 100 Easy, Healthy, and Delicious Recipes that are Sugar-Free, Gluten-Free, and Grain-Free. Full of delicious, unique and (generally) nutritious ideas, everyone at the table will be able to have the Comfy Belly they deserve.